There is no doubt that the popularity of NGDP level targeting is increasing and with that partly also the popularity of Market Monetarism. However, as the popularity is growing so is the misunderstandings about both. First, I would stress that while Market Monetarists advocate NGDP level targeting the two things should not be seen as the same thing. NGDP level targeting is a monetary policy advocated by Market Monetarists, but also by others – such as certain New Keynesian economists such as Christina Romer and Michael Woodford. Market Monetarism on the other is an economic school – or said in another way – it is a way to think about monetary policy and monetary theory. Today I came across an interesting article by Niranjan Rajadhyaksha with the intriguing headline “India does not need market monetarism” that illustrates some of the misunderstandings about Market Monetarism and NGDP level targeting. The Bank of Japan said on Tuesday that it would try to push up inflation as part of a new strategy to stimulate the economy. Such an attempt would have been met with gasps of disbelief a few years ago, when low inflation was the central quest of monetary policy. A higher inflation target is now becoming an important part of the ongoing policy debate, at least in the developed countries that are still struggling to recover from the economic effects of the financial crisis. What has just happened in Japan is another victory for a group of economists called market monetarists, who have argued over several years that policymakers should target the nominal gross domestic product (NGDP), which is a combination of real output and inflation. Targeting nominal GDP can be contrasted with what the two main schools of macroeconomics suggest: the traditional monetarists look at money supply and the new Keynesians look at interest rate. Well, yes it is a victory in the sense that the Bank of Japan now finally is clear on what the central bank is targeting (2% inflation). However, Market Monetarists would certainly have preferred an NGDP level target to an inflation target. The market monetarists once tried to be heard from the sidelines. They have since gained popularity and are now an important voice in the corridors of power. The US Fed has not yet embraced nominal GDP targeting, but there are signs that market monetarism is getting heard in that institution. Chicago Federal Reserve president Charles Evans is one important convert. So far so good, but again an higher inflation target in Japan is not an NGDP level target, but certainly better than the non-target the BoJ has effectively been practicing for the past 15 years. The situation in India is very different. It is unwise to use higher inflation as an important part of any strategy for economic recovery, though there has been loose talk of allowing the Reserve Bank of India to let its unofficial inflation target rise. India already suffers from structurally high inflation. Inflation expectations seem to have drifted up in recent years. These will damage the economy in the long run. Yet the Indian government has been following a perverse variant of nominal GDP targeting. High inflation has led to robust nominal GDP growth despite the slowdown in real output, which in turn has ensured that the burden of public debt in India has not expanded despite large fiscal deficits. Look at the numbers. Nominal growth in fiscal 2011 was 17.5%, the highest in 20 years. Nominal GDP growth has been growing faster in the four years after the global financial crisis than in the four years that preceded it. In other words, the Indian government has been inflating away its old debts, most of which are held by Indian households through the banking system. Market monetarism and nominal GDP targeting may make sense in economies that have persistent negative output gaps and interest rates at the lower bound. India is in a different situation. It needs lower inflation to get its economy back on track. Niranjan seems to equate Market Monetarism and NGDP level targeting with a desire for higher inflation. The fact is, however, that Market Monetarists don’t advocate higher inflation. We advocate a higher level of NGDP for countries such as the US or the euro zone where the level of NGDP is well below the pre-crisis trend level. We don’t concern ourselves with the “split” between real GDP and the price level – the only thing we concern ourselves with is the NGDP level. Furthermore and much more importantly we are advocating a rule based monetary policy – so we are not advocating the central bank should jump from one stance of policy to another in a discretionary fashion. In addition Market Monetarists are not “hawks” or “doves”. We are doves when the actual level of NGDP is below the targeted level of NGDP and hawks when the opposite is the case. So yes, for the US or the euro zone we might sound as “doves” in the sense that we (the Market Monetarist bloggers) have been advocating easier monetary policy to bring back NGDP “on track”. What we are arguing is not “stimulus” in a discretionary fashion, but rather a return to a rule based monetary policy. From 2000 and until the outbreak of the Great Recession in 2008 Indian NGDP grew by around 12% a year. There is is obviously nothing “optimal” about that number, but lets as a starting point see that as our benchmark. The graph below shows the actual level of Indian NGDP and a 12% growth path for NGDP starting in 2000. 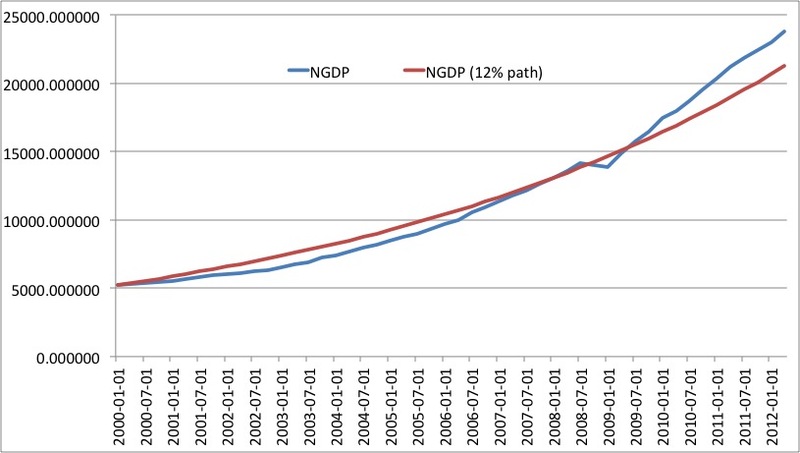 The graph is pretty clear – actually NGDP has been running well above the 12% path in recent years. So if the Reserve Bank of India (RBI) had targeted a 12% NGDP level path then it would certainly had kept a tighter monetary stance in recent years than what actually have been the case. Hence, the Market Monetarist advise to the RBI would be to tighten monetary policy – rather than the opposite.This illustrates that Market Monetarism is not about being “hawkish” or “dovish”. It is about advocating a rule based monetary policy and at the moment a 12% NGDP level target for India would mean that the RBI should tighten – rather than ease . monetary policy. Therefore, Niranjan is certainly right when he is arguing that India does not need monetary easing, but that is exactly the conclusion you would reach as a Market Monetarist! In fact I think that most Market Monetarists would think that a 12% NGDP level target for India is too high and I would personally think a long-term NGDP level target path should be around 7-8% rather than 12%. Concluding, if the RBI had an NGDP targeting rule it would have kept monetary policy significantly tighter in recent years. The actual conduct of monetary policy in India has nothing to do with Market Monetarism. The only difference between the ECB and the RBI is that the ECB failed on the “tight side” while RBI failed on the “easy side”. So Niranjan, you are right to worry about the RBI’s overly easy monetary policy, but don’t blame Market Monetarism. You should rather endorse it. We are with you – the RBI has failed exactly because it has not conducted monetary policy within a rule based framework and the RBI should tighten monetary policy sooner than later. And of course introduce an NGDP targeting rule asap. PS a major advantage of NGDP level targeting compared to inflation targeting is that NGDP level targeting would “ignore” supply shocks. This is very important for an Emerging Market economy like India where headline inflation often is driven by supply shocks in the form of changes in food and energy prices. Hence, it is well-known that most of the short-term variation in Indian inflation is driven by food prices. A strict inflation targeting central bank would react to higher inflation by tightening monetary policy – this is of course the ECB style inflation targeting regime. Contrary to this an NGDP level targeting central bank would not react to supply shock and instead just keep NGDP on track.